You’re ready to be the CEO of your business. You wish you could effortlessly manage your daily routine with crystal clear priorities. You want to feel confident in what you’re doing each day, knowing exactly where to focus your energy. Plus, you are SO ready to have the freedom to work with new clients, write your book and pick up your kids after school. It’s possible to have clarity and confidence in your business. I help established coaches and creative entrepreneurs who feel like there aren’t enough hours in the day to reach their goals. They’re letting clients walk away because their endless to-do list is overwhelming. I create a personalized, actionable plan so they can build a streamlined, successful business that they love. Before branching out with my management and consulting work, I spent over 10 years in the office products industry developing consumer products. In fact I worked for my family’s business and was planning to take over the company in the future with my siblings. I had BIG PLANS for my future and could see exactly how my career would pan out all the way to retirement (and beyond). I got so broken down by the corporate machine. The struggle to be two different people – one that was cold and calculating and only cared about the bottom line, versus my truer nature that cared about the environment, customer experience, office culture. My low point – being told in a performance review that, after a year of amazing professional highs, I lacked empathy. And worse yet, being completely okay with that. I believe my response to my husband, when later recounting my manager’s comment was, “yeah, so what”. I literally had to look up the definition of compassion. It was such a foreign concept to me. And so, I took an extended leave from the company in 2014. During that leave, I explored my own mind and, while in a session with an outstanding business coach, the idea of virtual assistance work. So I researched and looked around and got my first paying gig within a few weeks. Before I knew it (aka about 6 weeks later), I had a long-term client and then another and another! I loved helping these amazing coaches bring their talents to the world. I was truly making a difference in the lives of these women, so that they could in turn help clients to make positive changes in theirs. Then the time struggle set in. I had returned to my corporate role as a full-time Brand Manager for the office products manufacturer, responsible for a product line over 400 items, AND I had four full-time clients that I loved serving. It became too much. I couldn’t do both well anymore and still have a thriving personal life too. I wasn’t about to end my marriage – that was a non-negotiable. I had to say ‘no’ to one of my career paths. After many sessions with another amazing coach (have you noticed that I love coaches? ), pushing through the fear, I set a date to hand in my resignation to my corporate job. The week before I had planned to turn in my resignation letter, I woke up with an ocular migraine and couldn’t go into work. For me, these headaches are stress-induced; my body was screaming at me and I had to listen. So the next day, and a week early, I resigned. I picked myself. I chose to follow what my heart knew was best for me. It was the desire to help people on a more personal level that ultimately led me from the corporate world to my work with small businesses. To work 1:1 with people to wrangle in their business schedule, systems, operations, and team, so that they could focus solely on their gifts to the world and build a business and life that they love. The planet is filled with amazing women entrepreneurs, full of inspiration, passion and resilience. They’ve gotten things to work “well enough” in their business, but it really isn’t clicking as they hoped. They’re working too hard for too little in return. As in the corporate world, I can see these business blind spots (that’s my superpower) and put together an action plan to building a successful business. Today, my migraines are gone. My schedule is as flexible as I want it to be. I use my spare time to volunteer helping local women entrepreneurs grow their businesses. I have the agility to try new business ideas within my own business, versus getting buy in from multiple department heads in a corporate setting. I can shape my client experience in a way I couldn’t in the corporate world. And most importantly, I’ve built a business that I love. I’m devoting my time to something I truly care about. I’m using my innate skills in systems and management to build thriving businesses with my clients. My work matters, and so does yours. To learn more about how I can help you, click here to check out my current services and packages. 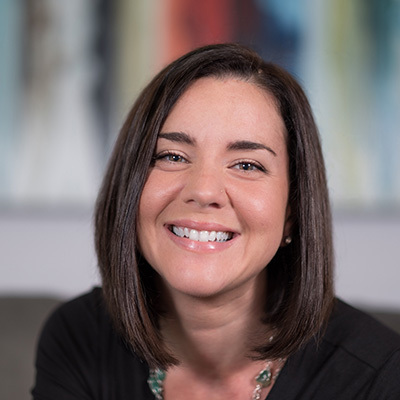 Lindsay Gomez is an organization and systems expert, who helps coaches create personalized, actionable business plans so they can build a streamlined, successful business that they love. Before launching her own business, Lindsay spent over a decade in the office products industry in various marketing and management roles, including the development of consumer office supplies and oversight of national and private label product lines. Her passion to help others reach their next level, through better use of their time, team, and technology was what drove Lindsay to make the decision to leave the corporate world and work with small businesses. Lindsay lives just outside of Chicago, Illinois, with her husband and two adorable rescue pups.